Technovation is a global technology entrepreneurship program for girls. It challenges girls all over the world to build a mobile app that will help solve a community problem. Thanks to the support of leading tech companies and scores of volunteers, the program is entirely free. Between 2010 and 2015, over 3000 girls from 28 countries have created and submitted apps to the Technovation Challenge. The next round of challenges closes this coming April 21st. The Curiosity Machine is a website that features dozens of Design Challenges (DCs) for elementary age children. Each Design Challenge features an inspirational videos where diverse engineers and scientists describing how they engage in engineering design practices and fundamental science and engineering principles in their own work. A grant from the National Science Foundation's Advances in Informal STEM Learning (AISL) program allowed Iridescent to further refine the Curiosity Machine website, add new design challenges, and help hundreds of children and families complete multiple design challenges. They also managed to train dozens of teachers and mentors. This took place both in full-day Summer Camp programs, as well as weekly Family Science programs where parents and kids got together at their local school or library in the evenings. I helped Iridescent with a modest evaluation of these two programs. While the nature of the program precluded any formal evaluation of learning outcomes, the reflections that students posted provided clear evidence of engagement in the engineering design principles. Specifically, when asked which Design Challenges best helped them practice being curious, creative, and persistent, the young children were able to articulate how the three engineering design practices intersected with the features of the various challenges that they completed and why. Given the age and prior experience of the learners, it seemed like some great initial evidence of meaningful engagement. I was able to observe one of the Family Science days at an urban school in Los Angeles. It was a very diverse group of families. It was a very small informal sample and it was too noisy to leave me able to transcribe much of the recording. What really impressed me was the way that families (some with two or three kids of different ages) worked together to complete the design challenges. That and the satisfaction surveys that kids and parents completed at the end of the program made it clear that they were also having fun. I came away from this initial collaboration very impressed with the Curiosity Machine and the Design Challenges. The initiative had broad impact on hundreds of children, families, mentors, and educators. While we were not able to do any serious ethnography, I am sure that those experiences transformed the trajectories of many children and families—much in the same way that good science museums have been doing for years. The initiative also left behind a really useful set of design principles for creating challenges that other STEM educators should find useful. And the Curiosity Machine provides a nice context for further exploring some fundamental questions that science educators and learning scientists have struggled with for many years. 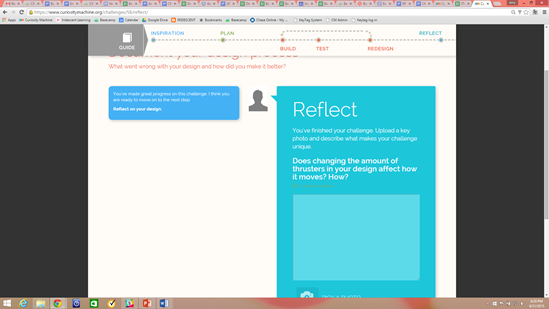 Each DC pushes the student to meet a specific challenge, upload photos, videos, and reflections, get feedback from a virtual mentor, and redesign. even the youngest learners what they need to do at each step. After viewing the inspirational video, a series of easy-to-follow pages then scaffolds the use of everyday materials to solve open-ended engineering design problems that challenge students to apply those principles. For example, the the Air Powered Spinning Machine helps learners use balloons. ping pong balls, straws and other materials to help children learn about thrust and lift. The home page of each DC is clearly designed to allow even very young children to keep track of where they are and access each of the phases. What I love about Iridescent is the way that the Design Challenges seamlessly embed disciplinary engineering concepts (e.g., thrust and lift, the stuff that engineers know in the abstract) into the disciplinary practices of solving the design challenges (simplified versions of what engineers do in context). They nicely focus on three simple practice that make sense to even very young children without getting "cutesy" with songs. 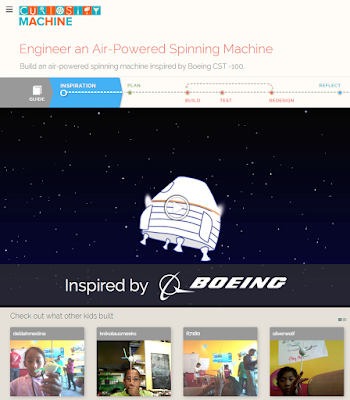 Check out the way Boeing Engineer Tony Castilleja describes thrust and lift as they relate to airliners and space capsules in this video from the Spinning Machine Design Challenge. Current theories of learning argue that the most productive forms of engagement are those that lead to lots of connections between the disciplinary concepts and disciplinary practices. For this to happen the practices first need to be meaningful. This is hard with young children. For many elementary age kids, lift and thrust are still very abstract concepts. Jet planes and space capsules are certainly more concrete contexts that might help older kids makes sense of these concepts. Iridescent are not the first people to realize that younger kids need more simple "hands-on" contexts to make such concepts meaningful. But they seem to have done a particularly good job of building on the principles of informal science education to put them together in a professionally designed website and hundreds of well-produced videos. 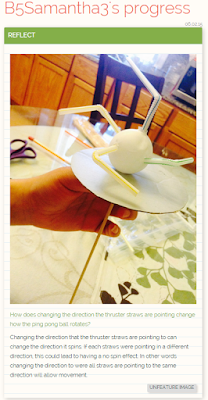 By combining videos and hands-on activities, the design challenges let parents and children to engage in engineering design practices that both find meaningful. I witnessed this first hand when I was in LA watching a dad help his kids understand the principle of thrust while they were redesigning their spinning machines. He was gentle but persistent as they bent the straws of their spinning machines in different directions and added additional straws as they tried to make their machines spin faster and faster. I assume that because they had watched the video together, the dad knew how his kids had been introduced to principle. This let him reference both contexts while also drawing on his own (more abstract) understanding of the principle. the learner's perspective. She argued that we need to "problematize" disciplinary concepts and skills. I think that most adults intuitively understand that the jet planes and orbital lander are not very meaningful to younger children. Yet in many science classrooms, this point gets lost in the incessant push of classroom management and accountability. I suspect that if the Design Challenges were used in elementary classrooms, some teachers would bypass the messy hands-on part and just have the kids watch the video, help them memorize definitions, and then give them a quiz on those definitions. This is exactly what found in my evaluation of the Adventures of Jasper Woodbury math problems solving videos in my dissertation. More importantly, in the classrooms where the teachers did that, the huge impact that Jasper Woodbury had on math problems solving achievement disappeared. potential. We call attention to the disagreement in the literature as to the role of everyday experiences in children’s developing scientific thinking. Some researchers are optimistic that everyday settings can be powerful, productive sources for (eventual) sophisticated, mature scientific knowledge. 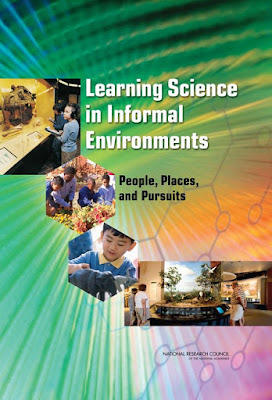 Others are more guarded and focus on how formal instruction should elicit and often correct scientific or science-like ideas that are developed in everyday settings (p. 116). This "conceptual change" debate has simmered for years in the design of formal school curricula. It provides an important backdrop of the more practical debate that emerges out in the design of "semi-formal" curricula. This refers to designed environments like the Design Challenges and the sorts of activities that are often wrapped around museum exhibits. The obvious quesion is whether there a "middle ground" that effectively invites the kind of engagement that leads to increasingly useful and accurate conceptions of science, without resorting to formal school practices. Iridescent obviously does not want families working together on Design Challenges to feel like parents helping kids with school homework. researchers and evaluators have found that participants can reflect on the enterprise of science and on their own thinking about science in the context of designed settings. Facilitation appears to be critical to supporting reflection. However, in designed settings, extensive facilitation by professional staff may not be feasible. And it may not always be desirable, as it can interfere with leisure experiences and interrupt other important developments in the participant experience (p. 162). Effective facilitation can be really challenging in any setting. But is particularly challenging to provide online and at scale. Furthermore, it essentially impossible to get resolve the challenges of facilitation at a general level. Rather teams of innovators need to engage in principled refinement of their programs and programming in the contexts where they are intended to be used, and carefully examining the amount and forms of engagement that emerge. There are just too many variables that interact with each other in complex ways. Consider Iridescent, for example. Because of the scale of their program, serious progress helping parents facilitate their children's reflection while working together at home has the potential to vastly increase the impact of their program. Then consider the difference between Iridescent's summer camp programs (where kids spend the whole day without their parents) with the evening program (where families come together for a couple of hours each week). Features and practices that effectively help parents facilitate reflection in one setting would obviously need to be refined for the other setting. Our evaluation showed the just half of the summer camp participants and just one third of the families in the evening program reported submitting design challenges from home. And those appeared to mostly be simply finishing up Design Challenges that they started during the evening program. Since nearly all of the participants reported having home internet access, it seems like motivation has to be an important variable. This raises the fundamental question about what Iridescent might do in the future to motivate families to start and complete Design Challenges on their own, and continuing to do so after the program is over. Getting back to the point above, some children and parents will be more motivated to engage than others. This means that some strategies that might be used to support facilitation and reflection might work help some families but not others. More specifically, some strategies that work to motivate facilitation and reflection in some families might actually undermine facilitation and reflection in other families. I will explore this challenge in my next post. As an educator, I would like to know if the lessons reference specific educational standards. From the descriptions, it seems there would be an obvious connection to Next Gen Standards. Thanks for the discussion! We are now adding robust educator resources (and training) for those who want to use the design challenges as part of formal instruction.